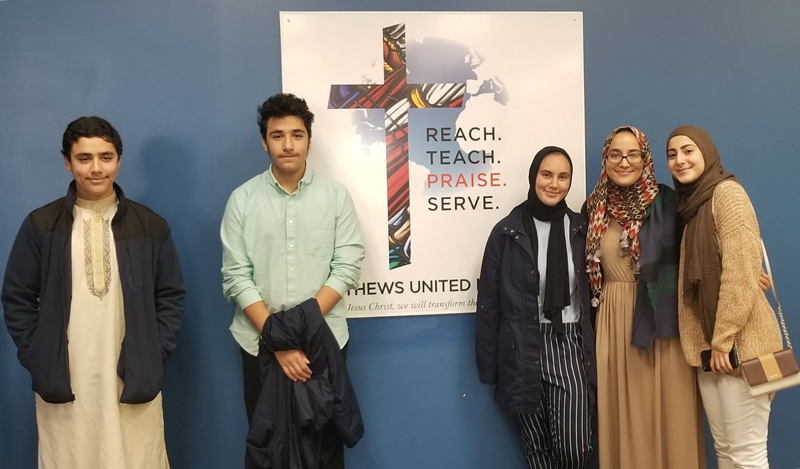 On Sunday 11th November 2018, Director Dorene Alama and Youth director Khadija Konoush, with a group of Muslim Youth went to Matthews United Methodist Church to conduct a presentation about the basics of Islam to a youth audience, of 7th-12th graders. They had presented an overview of Islam following a Q&A session which was conversed by the youth. Many topics were discussed. For example, the Hijab, bullying, terrorism, 4 wives Male and Female relationships. Alhamdolillah the presentation with questions was received well. We at American Islamic Outreach encourage our Youth to take part in these discussions as it gives a wider range of opinion, teachings, and dialogue with the generation of this culture. Inshallah we hope that this encourages the youth to come and help AIOF spread the word of Islam through their eyes and experience. Inshallah we hope to do more presentations like this in the near future with all different churches, schools etc. AIOF presentations are to help and provide Islamic information and education to the American public. Many people have questions, incomplete information, and may have misconceptions or uninformed ideas about Islam and Muslims. We here at American Islamic Outreach want to help remove misunderstandings, and present Islam in a truthful manner. We try our best to answer all questions with the guidance from the Quran and the Learning of Prophet Muhammad SAW. We also provide context to clarify peoples understanding of quotes from the Quran.